Bryston B60R review | What Hi-Fi? Any company that offers a 20-year warranty on its amplifier must be pretty confident about the product's build quality. Poor build isn't something anyone can accuse Bryston of. All the products we've seen from this Canadian brand come across as rugged enough to last a lifetime. Pretty they are not. Style isn't something Bryston does, and neither is luxury. That's more understandable when you realise the company is one of the few hi-fi specialists as serious about the pro market as it is the domestic. In the pro world, hi-fi is merely a tool. Fancy finishes and design do not carry any weight in that environment. It's the ability to play loudly, reliably and take lots of abuse over time that's paramount. Durability is important to us, but so too is sound quality. It's an area where much studio-based gear lets itself down. There's no such concern here, as Bryston has the knack of turning out great-sounding kit on a consistent basis. The B60R is no different. Let's get the negatives out the way first. This is no powerhouse. It's rated at 60W per channel, which is on the low side for a transistor-based amplifier at this price level (the norm is about double that). 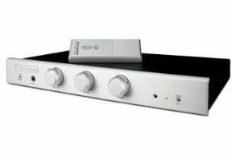 True, it goes up to the healthier sound of 100W into four ohms, but the fact remains that's well below the multi-hundred Watt outputs of rivals such as Krell's S-300i or Plinius's 9200 – and you can tell. The relatively low power output translates into reduced authority as the volume levels rise, and a loss of dynamic reach when the music gets busy. But that's where the bad news ends. The B60R plays things with a very straight bat. It's tonally very neutral, decently detailed and has a good grasp of fundamentals such as timing and dynamics. There's a very real sense of the amplifier not messing about too much with the signal (power limitations apart), and it's as happy replaying the likes of Lady Gaga's The Fame as it is something grander such as Shostakovich's Symphony No.7. None of this sounds very glamorous or particularly outstanding, and that's very close to the truth. The B60R is something of a workhorse. It will do the job with the minimum of fuss and draw remarkably little attention to itself. This is a usefully flexible amplifier, too. You can order a machine with a decent quality MM phono stage or a rather good onboard DAC. You'll need to add £595 and £1275 respectively to the amplifier's price, though. If you plan to buy an amplifier that will impress other people, this slimline machine should be nowhere near the top of your shortlist. There are far flashier performers out there for similar or less money. However, if the music and recordings take top priority, it's well worth giving the Bryston a thorough audition. It might just be exactly what you are looking for.